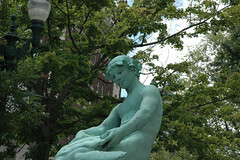 The fountain/statue was a gift to the city of Worcester given by Harriet Pamela Foster Burnside. It was meant as a tribute to her father, a prominent Worcester attorney. 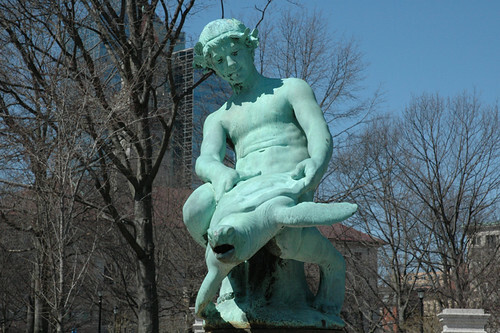 Turtle Boy’s “real” name is the Burnside Fountain. The Burnside Fountain was originally a watering trough for dogs and horses (see pictures in gallery – you’ll note the basins up front for horses, small ‘dog bowl’ on the back). The original gift was $5,000, given around 1905 (Worcester Telegram & Gazette site says 1905 / Smithsonian says April 6, 1904). 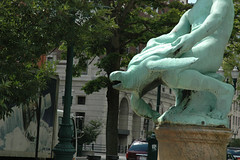 The statue was finally unveiled in 1912. The original location was across the street at Salem Square but it was moved in 1969 to make way for construction. Artist, Daniel Chester French, was commissioned to create the statue. He assigned the job to Charles Harvey, his protege. Work on the pedestal was started by Lincoln Memorial architect, Henry Bacon, but was completed by his assistant, Sherry Fry, after his death. The statue is made of bronze; the pedestal is pink granite.